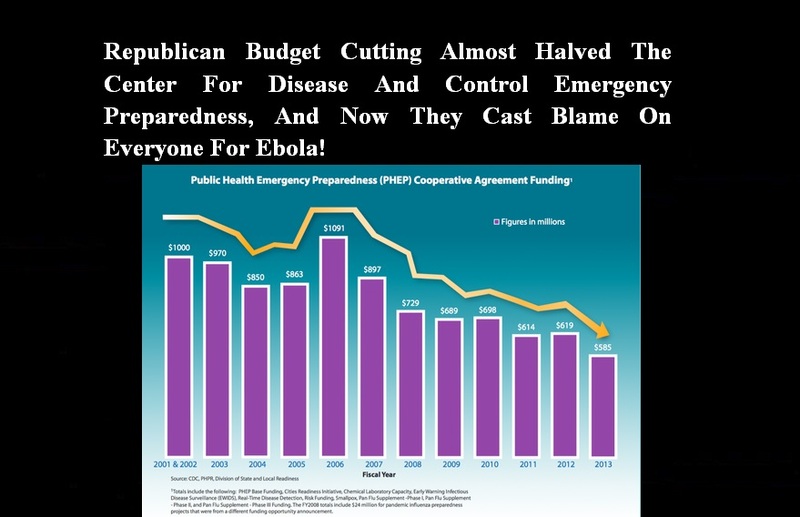 Republican Budget Cutting Almost Halved The Center For Disease And Control Emergency Preparedness, And Now They Cast Blame On Everyone For Ebola! It’s not just the NIH that’s suffered, and it’s not just in Africa where the cuts are harming people. The Center for Disease Control’s emergency preparedness budget has been nearly cut in half in just the past seven years. That means preparation at home. That means that local health departments in this country don’t have the funding—or the staff—they need to do the necessary preparation and training to deal with any epidemic. Judy Stone, MD is an infectious disease specialist, details the cuts at Scientific American. The CDC’s discretionary funding was cut by $585 million during [2010-14]. Shockingly, annual funding for the CDC’s public health preparedness and response efforts were $1 billion lower for 2013 fiscal year than for 2002. These funding decreases have resulted in more than 45,700 job losses at state and local health departments since 2008. Again, it is not just the Ebola that is a looming threat. We need to worry about vaccine-preventable but neglected infections like influenza, measles, and whooping cough; the serious emerging viral infections in the US like Enterovirus-D68, chikungunya and dengue, as well as overseas MERS and bird flus, and natural disasters.